The bottom rail shown in red is dropping. 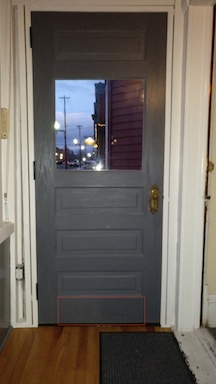 I salvaged this door and had it installed a couple of years ago. I am certain the installer did cut a little off the bottom for the install. So all was even at that point. Then over time, the bottom rail fell. It was cut flush again this spring, but now 6 months later it is dropping again. Someone told me that it must be because the mortise/tenon joint was loose, perhaps the mortise was cut too big for the tenon. But I would think eventually the tenon would bottom out and hit the bottom of the mortise. This should have happened by now, having been cut flush twice. My plan was to put a dowel through the joint that would go from the font to just shy of the back. Then it wouldn't show on the back and I would cover the front with a kick plate. But, then when I was about ready to do this task, another person looked at the door and doesn't think that this is a mortise/tenon joint door. They think it's dowel joints instead. In which case, I have very little chance of hitting the joint with my original plan. My questions: what kind of construction is this door? Are there any hints I can look for to find out how it's constructed? Why is that bottom rail dropping? How would you fix it? It could be mortise & tenon joint, or it could be a doweled joint. About the only clue you could see easily is if the tenons are through-tenons and the ends of the tenons would show on the side edges of the door. Also, you might see evidence of peg ends on one or both faces of the stiles. If it is a mortise & tenon, the bottom end of the mortise could have been trimmed away when it was installed (here or in its previous location), which would allow the tenon and rail to slide down. You might be able to see if this is happening by looking at the bottom edge of the door.